The rapid development of Sanya’s yacht industry is challenging the yacht management in Sanya Port, which is now becoming increasingly crowded as more yachts are docking there, reports hinews.cn. 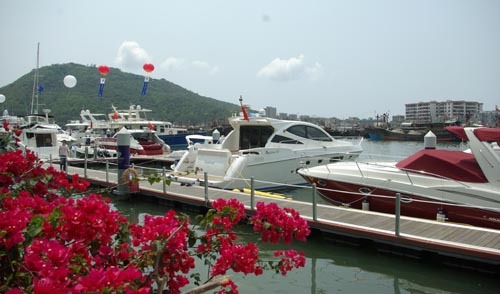 At present, there are 2 yacht clubs and more than 65 yachts in Sanya. With more yachts together with other fishing boats and cargo ships pulling in and out Sanya Port, the Sanya Maritime Safety Administration feels a great pressure to conduct supervision on these vessels. "Last October, a small yacht lost power in the East Island of Sanya. Due to the lack of registration procedure before voyaging, it took us a long time to locate it," said an officer with the Sanya Maritime Safety Administration. In order to improve safety and regulate the order of yachts in Sanya, local maritime authorities will strengthen supervision on yacht registration and conduct a selection of training programs to train more professional yacht operators.